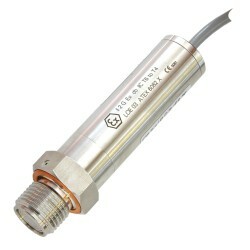 ATEX certified flame proof pressure transmitter with an open face pressure connection for use with pharmaceuticals or high viscosity media in hazardous areas requiring flame proof protection. The 25 Ed flame proof flush pressure transmitter has a semiconductor piezoresistive sensing element contained within a oil filled capsule with a flush isolation diaphragm. A choice of oil fillings are available to suit food, pharmaceutical and oxygen service applications. The 25Ed flameproof flush pressure transmitter is available with low range pressures from 3 psi up to 300 psi vented gauge or absolute plus high range pressures from 15 up to 1500 psi sealed gauge. Negative gauge pressures from -3 psi down -15 psi gauge can also be specified for measuring vacuums. The output signal of the 25Ed flame proof flush pressure transmitter can be 2 wire 4-20 mA, 3 wire 0-20 mA or 3 wire 0-10 volts. A polyurethane jacketed cable is provided for the electrical connection which is sealed at the backend to IP65 with the option for an M20 female thread to fit an outer protective conduit. For vented gauge versions a PE sheathed cable is used which includes a vent tube for referencing to atmospheric pressure. 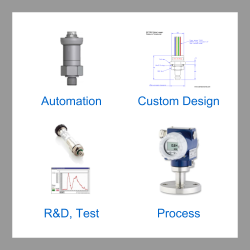 Please select the options you require for the 25 Ed Flame Proof Flush Diaphragm Pressure Transmitter in your application and request a quote. Send us your enquiry for 25 Ed Flame Proof Flush Diaphragm Pressure Transmitter to get assistance with this product type.